Munich - In the wake of a dramatic Matchday 25, which saw FC Schalke 04 down neighbours Borussia Dortmund and Fortuna Düsseldorf almost pulling off the seeming impossible at FC Bayern Munich, we asked you to vote for the weekend's standout player. Six candidates were nominated and the ballots poured in from Bundesliga fanatics across the globe, with one overwhelming favourite. 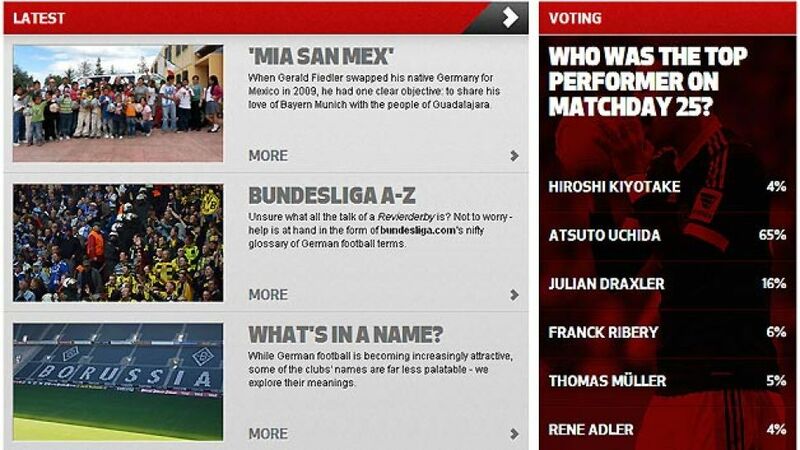 bundesliga.com rounds up the results. The Revierderby between behemoths Schalke and Dortmund received top billing last Saturday and given the former's 2-1 triumph, it was perhaps inevitable that the victors' key contributors would loom large. The size of the shadow cast by over his fellow nominees was, however, far less predictable. The 53-time Japan international received a whopping 65 per cent of your votes in recognition of his pair of inch-perfect crosses to tee up scorers Julian Draxler and Klaas-Jan Huntelaar. Furthermore, the right-back was as solid as ever in defence, winning 53.9 per cent of his tackles against Robert Lewandowski and Co, and completing 56.7 per cent of his passes. 19-year-old was next, tallying 16 per cent of the ballot thanks to his barnstorming display against Dortmund. Further testament to the youngster's prodigious talent was the fact that the match marked his 100th senior appearance for the Royal Blues. The midfielder's strike, a technically exquisite first-time effort from 15 yards, was his seventh of the campaign and the all-important opener to put the visitors on the back foot. While Draxler was tormenting the defending Bundesliga champions, the champions-elect were labouring to get the better of Düsseldorf. FC Bayern twice went behind to the promoted outfit before eventually snatching victory, with goalscorers (six per cent) and (five per cent) honoured for their part in keeping the Bavarians' 2013 winning streak unblemished. The final eight per cent of the votes were evenly split between 1. FC Nuremberg's trouble-maker-in-chief and Hamburger SV's lifesaver against Stuttgart, . The former scored with his only shot of the game to help beat Augsburg 2-1, taking his direct involvement in der Club's league goals to 42 per cent (11 from 26), while Adler made seven saves to almost single-handedly keep Stuttgart at bay and help HSV into the European places with a 1-0 win. Make sure to keep an eye on our FANZONE page this weekend to have your say on the top performers of Matchday 26.